There is a possibility of late comers as I have 5 extra tickets. The price of the tickets will be $20.00 per person with children 12 and under free. If we get some late comers, the price will go down to $15.00 per ticket. We have excellent seats in section 30 on the Harvard side, which is at about the 40-yard line ¾ of the way up the Stadium. We are two sections over from the Harvard Band, which is in section 28, so you will be able to hear and enjoy their music. The tailgate will begin at 11:15 AM and kick-off is at 1:00 PM. The tailgate will be in Webster Field, the small grass parking lot immediately behind the closed end of the Stadium. If you are walking you will enter by Gate 8 across the street from the Business School and a practice soccer field. I hope to be in the very first row of Webster Field, the row closest to the Stadium. I hope also to be in the middle of the horseshoe comprising the closed end, opposite the only gate in the closed end of the Stadium where spectators can enter. I will be in tan Hondo Pilot SUV with CT plates. If you have a problem or are lost, you can contact me on my cellphone at 203-305-5754. I will have your tickets and will give them to you at the tailgate at which time you pay me. As stated in the earlier email, you can park in the Business School lot, which is directly across from Gate 8 at a cost of $ 7.00. 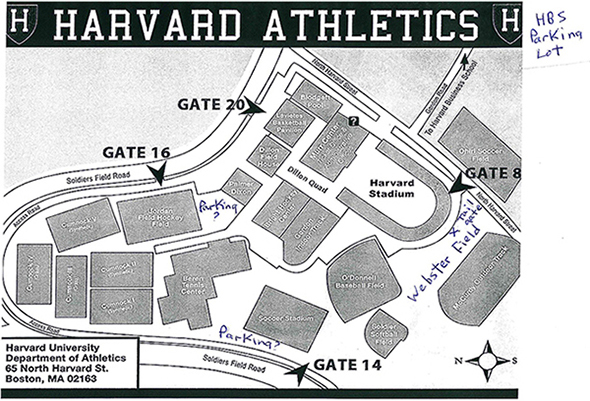 You can also enter the Harvard Athletic Complex through Gate 14 on the far side of the complex for $20.00. You will be directed to a parking area and then you can walk to the closed end of the Stadium. If you have any last minute questions, concerns or comments, please let me know. Also, please remember to bring a blanket to sit on as the concrete seating at the Stadium can get a bit hard and uncomfortable. We are looking forward to seeing all of you as we “kick-off” our 50th Reunion Celebration. Thanks for your enthusiasm and participation. The tailgate will be in Webster Field, the small grass parking lot immediately behind the closed end of the Stadium. If you are walking you will enter by Gate 8 across the street from the Business School and a practice soccer field. I hope to be in the very first row of Webster Field, the row closest to the Stadium. I hope also to be in the middle of the horseshoe comprising the closed end, opposite the only gate in the closed end of the Stadium where spectators can enter. I will be in tan Honda Pilot SUV with CT plates. If you have a problem or are lost, you can contact me on my cellphone at 203-305-5754. I will have your tickets and will give them to you at the tailgate at which time you pay me. As stated in the earlier email, you can park in the Business School lot, which is directly across from Gate 8 at a cost of $7.00. You can also enter the Harvard Athletic Complex through Gate 14 on the far side of the complex for $20.00. You will be directed to a parki ng area and then you can walk to the closed end of the Stadium.